Hey folks, remember this infographic from a few years back? I seem to remember posting about months ago, possibly in reference to 28 Days Later because I thought it was just so clever. Well, yesterday as I was typing out my zombie story, I got to thinking about this graph and how it applied to the basic rules I’ve seen in zombie movies. 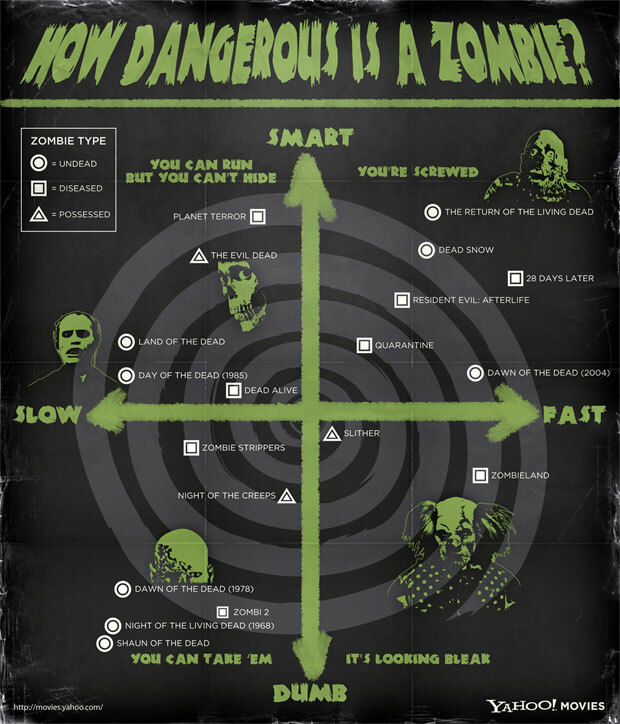 As you can see, they not only classify zombies based on how fast and how smart they are, but also what form their zombie-hood takes. The basic breakdown they use involves three categories – undead, diseased, or possessed. This is one more than I acknowledged and I wonder if its apt. Can you really distinguish between diseased and undead when so many examples are both? For example, the dead in The Walking Dead were the result of a disease, but they were totally undead creatures. A lot of time goes into explaining just how undead they are when they show that even dismembered and beheaded zombies are alive so long as their brains are still intact. This puts them apart from the zombies in 28 Days Later who were also the result of a virus but were still very much alive. And then you’ve got the zombies in Dawn of the Dead (the 2004 remake) which were clearly the result of a virus (since the infection spread through bites) but were also undead. Shaun of the Dead follows the exact same pattern, with zombies who can withstand getting a pipe through the chest and losing a limb, but who won’t die until you shatter their brain pan. And even though I’ve never seen any of the Resident Evil movies, my understanding was they too were both undead and the result of a virus. Am I picking nits here, because I’ve been known to do that. Or this could all just be the result of over-analysis as a result of over-research. I tend to do that as well. Yeah, it really doesn’t matter much, unless you’re trying to write for the genre and insist on understanding all the ins and outs of zombie creation. Mainly I just wanted to share the graph again because its fun and it puts people in mind of their favorite zombie flicks. One question though… where would a Bath Salts zombie fall into all this? And how about that drunken weirdo in China? Do we need to revise this graph to take into account “substance abuse zombies”? My First Zombie Story: Whiskey Delta! Ha ha It is great to see such an in-depth analysis on Zombie because I just watched “Dawn of the Dead (2004)”. I guess the zombies in the original were of a different kind. Anyone who dies in that period becomes a zombie. Isn’t it ? Not sure about the original. But in the remake, they stated that anyone who dies from a zombie bite becomes a zombie. I will defend the 2004 Dawn of the Dead remake, Shaun of the Dead, and Resident Evil 1 & 2 (because who doesn’t love a little Jill in their world) to the ends of the earth. If it stopped breathing, and starts again, that’s as Zombie as I need it to be. Though I will say RE plays much stronger to the viral strain/mutation factor. Zombies are really only as limited as your imagination. And I personally think zombies are cooler when they’re created through magic. Vincent Price’s movie, Last Man On Earth, has diseased zombies that are very much alive. Spoilers here, but by the end of the movie you find out that they think Price is the monster as he has killed so many of them in the process of finding a cure. The disease had become stable and many of the ‘zombies’ had returned or remained in the family unit, raising thier zombie children and basically living thier lives as normal after having survived the initial outbreak. The parallel being people who survived small pox living a normal life but with scars now. Never mind, it’s vampires and not zombies. I own the movie and still thought it was zombies. Double checking, it does note that the vampires in the movie are more zombie like than vampire like. Yep, that’s the original adaptation of I Am Legend, isn’t it? Before Omega Man and the Will Smith version came about right?